Here’s a depressing news flash for those of you still feeling the economic burn: celebrities are doing better than ever according to Forbes. Box office is up, ratings are high and famous entertainers earned a collective $4.1 BILLION this year. 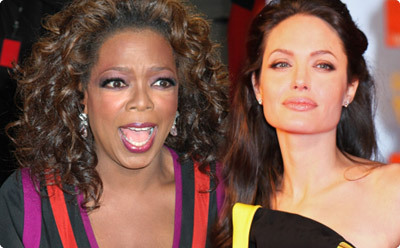 The popular business magazine released its annual ranking of the world’s most powerful celebrities this week. Topping the list, as usual, was Oprah… wait, never mind. I got that wrong. I’m glancing at the article a second time, I’m seeing that Angelina Jolie actually snagged the number 1 spot, knocking the talk show titan to number 2. First a Susan Boyle upset, now Oprah. What is this world coming to? Jolie isn’t qualified. So she’s dating Brad Pitt…big deal. And who cares if she adopted a truck load of kids? And did anyone honestly sit through The Changeling? Oprah picked our president. And she’ll probably be president one day. Forbes, get your act together and honor the more deserving individual. These are serious times.